HGTV is headed back to Sin City. This week, the network announced they’ve renewed the TV show Flip or Flop Vegas for a second season. A spin-off of Flip or Flop, the home improvement series features contractor and MMA fighter Bristol Marunde and his wife, real estate agent and designer Aubrey, as they showcase their home renovation and flipping skills. The show is one of several new Flip or Flop spin-offs, which include Flip or Flop Atlanta, Flip or Flop Fort Worth, Flip or Flop Nashville, and Flip or Flop Chicago. New York [June 5, 2017] HGTV has greenlighted a second season of Flip or Flop Vegas, the first spin-off from the network’s hugely popular series Flip or Flop. 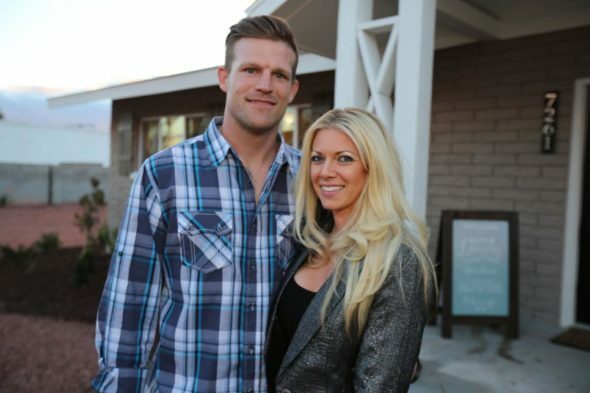 Attracting 12.5 million viewers since its season one premiere on April 6, Flip or Flop Vegas stars Bristol Marunde, a contractor and MMA fighter, and his wife Aubrey, a real estate agent and designer. Each episode follows the talented duo as they purchase dilapidated Las Vegas homes and renovate them into dazzling remodels that bring top dollar. The next episode of Flip or Flop Vegas will air on Thursday, June 8, at 9 p.m. ET/PT. What do you think? Have you seen Flip or Flop Vegas? Will you watch season two? More about: Flip or Flop Vegas, Flip or Flop Vegas: canceled or renewed?, HGTV TV shows: canceled or renewed? I love the show I’m moving to Vegas I want them to upgrade the house I’m moving into !!! Noooooo!!! Please DON’T bring this back! The show is horrible! The designs are RIDICULOUS! I HATE that I have to find something else to watch on a different channel when it’s on. Where did she get her design skills from? It looks like a raunchy motel with a bad Vegas theme. Who actually buys these homes? No one lives like that every-day! CANCEL THE SHOW! Flip or Flop Las Vegas is horrible! They could not have found two more plastic people. Ken and Barbie with as much personality as the dolls. The worst taste and two people with no personality. Watched once, never watch again. You’re so wrong. Give it a chance. Don’t be a hater just because they are both attractive…it’s not their fault they’re beautiful…can be pretty and talented and these guys are. Thanks! I love this show!! I love that the couple is so real! Hubby actually does the work! The wife is smart, a great designer,and adorable! When Flip or Flop Vegas first came on it was good. Now Aubrey has gotten carried away and her her choices are terrible. Wont watch anymore if she doesnt calm her decorating down. Las Vegas is my favorite city and I love Aubrey’s sense of style. I can’t wait for season 2! YES. Great chemistry. Like their over the top glam make overs. She’s so pretty and sweet. Shops for deals. He’s an over grown boy that likes to demo. he does good work but her taste and style is terrible. Doesn’t hold a candle to Joanna. Those emerald green cabinets and teal cabinets were horrible. Then all that orange to boot. I watched only one episode and was amazed at the lack of knowledge regarding renovation techniques. One example: dipping a paint roller into to can of paint before rolling it out. Have they not heard of roller pans? Also their renovation costs are absurdly low. The only reason this show might be reviewed positively is that viewers are even less knowledgeable than the producers!! This is the best new show on HGTV! We love Flip or Flop Vegas. The glam and glitter give us something to look forward to EVERY WEEK. Bristol and Aubrey are such a great couple. Can’t wait for season #2!!! I love the show! Aubrey knows design and has enough self confidence and experience to go out on a limb and try something new and give the bold and sparkly bling that home buyers in Vegas want. I also like the fact that she’s not afraid to give viewers tips on getting “bargains” for construction supplies. So glad they’re coming back! I loved it! I’m from the area so I love seeing houses like the type I live in being renovated and given character. I’m really tired of all the beige and neutral stuff flippers usually show. I also liked how this show wasn’t just drama and bad decisions like Tarek and Christina’s. Yeah they’ve run into bumps but they don’t get blown out of proportion…they get fixed and then the reno moves on. Sometimes I don’t like the Marunde’s design taste, but Sometimes I do! It’s fun to watch and see what they’ll come up with next. I’m excited!